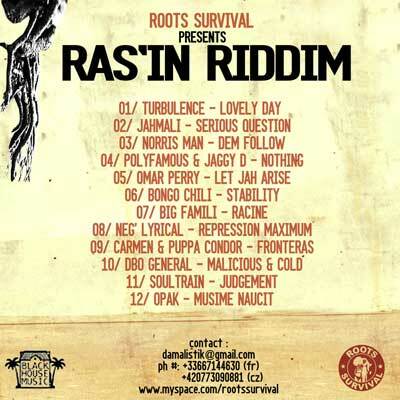 The Ras’In Riddim is the first riddim ever produced by Roots Survival Records . The riddim was made for the first album of Big Famili called Racines by King Kalabash and Baron Black ,a duo of two singers from Martinique and longtime friends..It have a nice Horns melodie and an attactive bassline who touch me so i decided to travel to Jamaica to add more artists on the riddim like the « Notorious » Turbulence , Jahmali , Norris Man , and Polyfamous & Jaggy D…And naturally Friends like Bongo Chilli , Omar Perry , Soultrain , Sista Carmen & El Condorsito for a version in Spanish and Opak a slovak rapper put their piece on the project. The 7’inch are still avalaible , just write an email to damalistik@gmail.com for more info. And this is the first video i ever did during a trip to Jamaica in 2008 with my friends Polyfamous and Jaggy D for their song « Nothing » on the Ras’In riddim mostly shoot in front of the legendary dubplate studio Killamanjaro.